Taking a look at a couple of books from DoGooder Comics today. The Scottish outfit have been quietly (or not so quietly depending on whether you're following publisher Colin Bell's Twitter!) 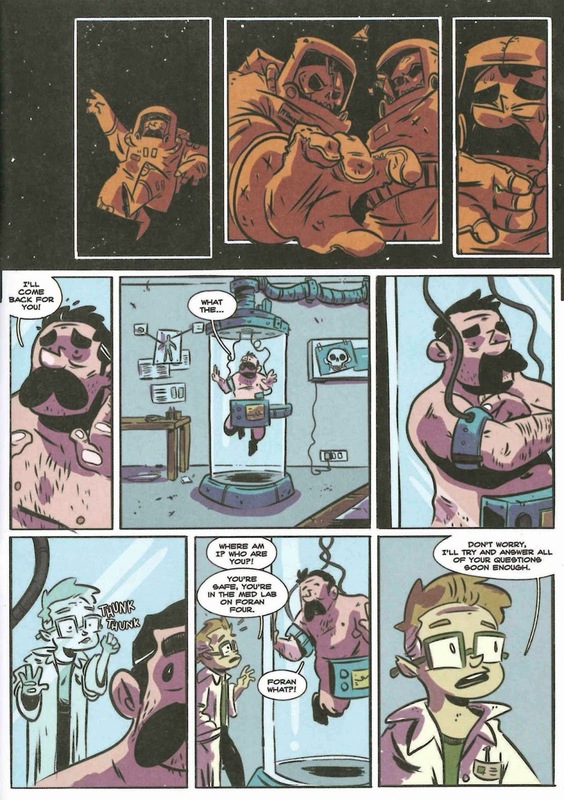 industrious, most notably with Bell's and Neil Slorance's Dungeon Fun series, which won a host of awards and has been selling very well indeed. Bell was kind (and thoughtful) enough to send me the a couple of new releases he thought were more up my alley, and I'm glad to see that they've branched out into working with a variety of artists with different styles- that can only ever be a strength, I think. 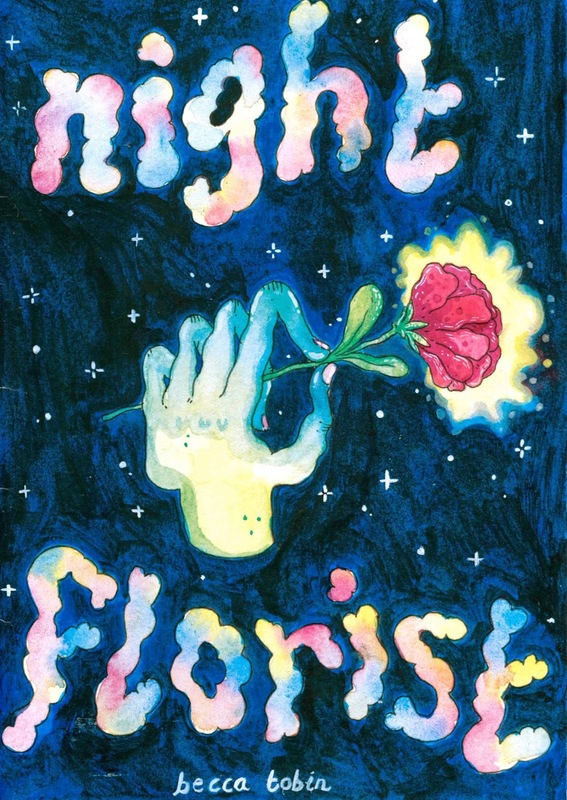 Night Florist by Becca Tobin: I'm a big fan of Becca Tobin's but this isn't really a comic; there's no inherent thematic link or narrative that makes the full page illustrations sequential- I guess there's an argument to be made to what degree the images could be called comics in and of themselves. There are a couple of short strips and a comic at the end. I mention this not to be pedantic- honest!- but because I know of a few people who were looking to pick this up as an introduction to Tobin's work, on the basis of the reputation she's built for herself online. What it is is a collection of art which still articulates why she's being talked about and gives you a feel to the tone of her work. Tobin has a style that takes elements of recognisable artistic strands withing the medium: there's the melting, sweaty viscerality of the Crumb aesthetic tempered by a more liquid and loose approach, offset with watercolour palettes often very warm and bright- raw pinks and deep oranges and yellows. The fluidity extends to both expression and lines: at times textures can take on a raw, bulbous sheen, and there's liberal depictions of bodily fluids, that when coupled with Tobin's pulsating colouring provide an unsettling point of interest. It's reminiscent of fine-lined French-Canadian styles- Pascal Girard's nervous lines come to mind, though Tobin has a surer hand, and despite these numerous interpretative facets. at it's best Tobin's work manages to retain an individuality -melding delicacy with body, and the afore-mentioned dollop of gloopy intrinsicness. The world she draws is a mystical, spiritual place inhabited by a furry, animal/human/creatures/plant beings, somewhat Trondheim-like at times. 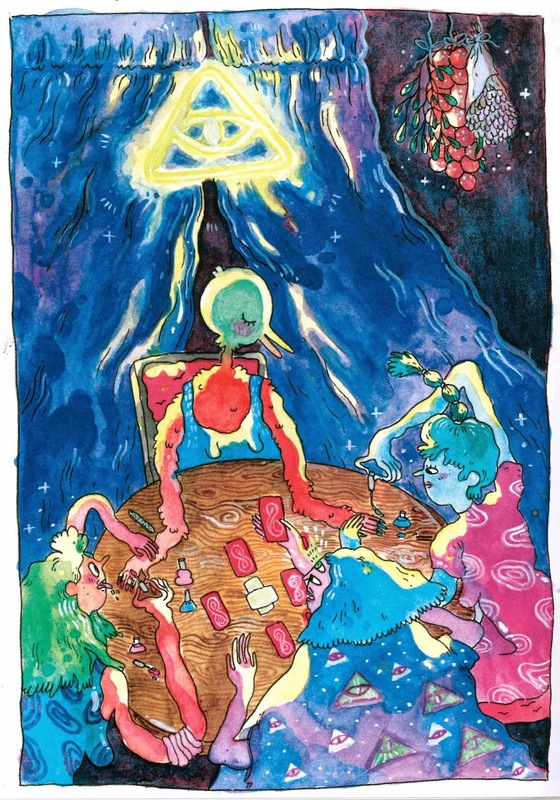 Her paintings are beautiful and well shown off in this A4 format: ranging from alternative tarot cards, people looking for connection as they immerse their head in screens straining to touch one another, sexual picnics, downtime nail painting, a woman and her dog cooling off with an ice-cream after decapitating a man with the sword she's leaning on. There's lots of eyes- that whole 'windows to the soul' seeing thing- not just third eyes, but eyes set in arms, on clothes, in a floating, glowing triangle, on the forehead. Sometimes an illustration is so brilliantly rendered that the sheer power of technique and mastery is what arrests the attention, others- it's something powerful that's figuratively represented -there are so many different ways to illicit demand- and whilst the illustrations here are visually pleasing, they suffer somewhat from a lack of meat, a focal point of engagement, they don't offer enough for the reader to latch on to. 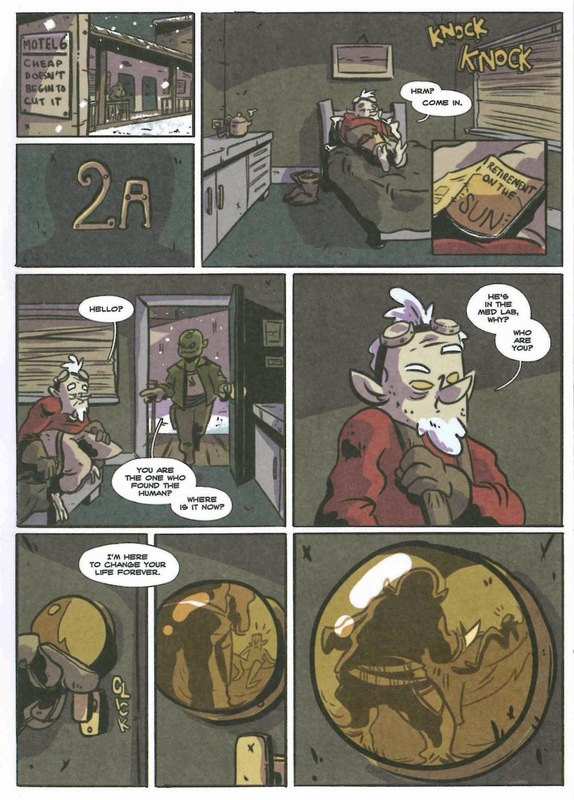 Tobin is very capable of producing of very good work: her excellent comic, Detective (from earlier in the year), for example, shows she has the chops, dancing a line between potential menace and humour, while her colours shimmer and drip with heat before your eyes; a pressurised scrutiny of sorts that requires investment. 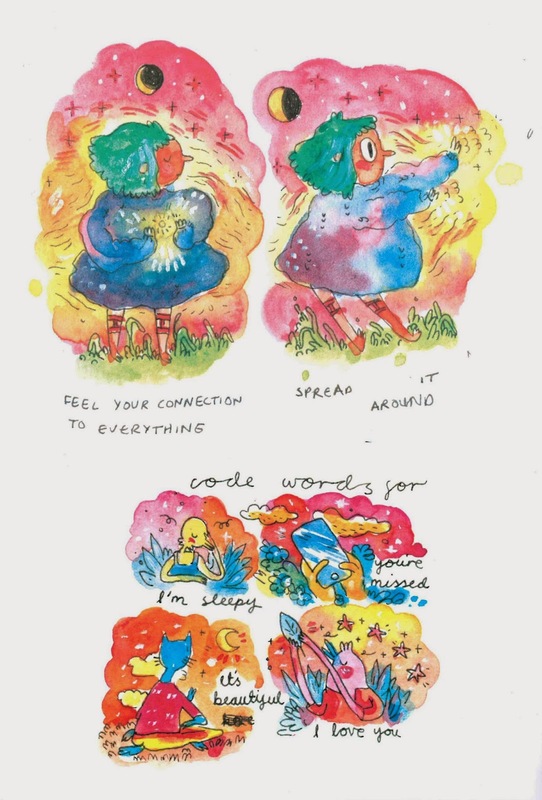 Similarly her Bird Lady comics are charming and funny and widely relatable. Tobin's a talented artist with lots of potential, and Night Florist is lovely to look at, but the selection of work here does a disservice in adequately showcasing her abilities. Space Captain by Chris Baldie and Michael Park with additional art by Dave Morrow: This was excellent. 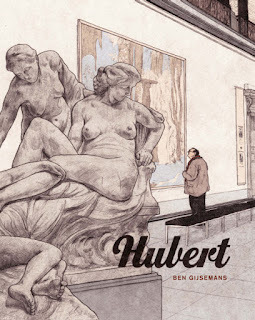 I'm unfamiliar with the authors and had only seen the cover previously as it made the comics internet rounds a bit, but had no clue as to what it was about. Apparently it had a very modest, very successful Kickstarter campaign via which it came into being -and if I was one of those backers I'd be delighted with what I received. 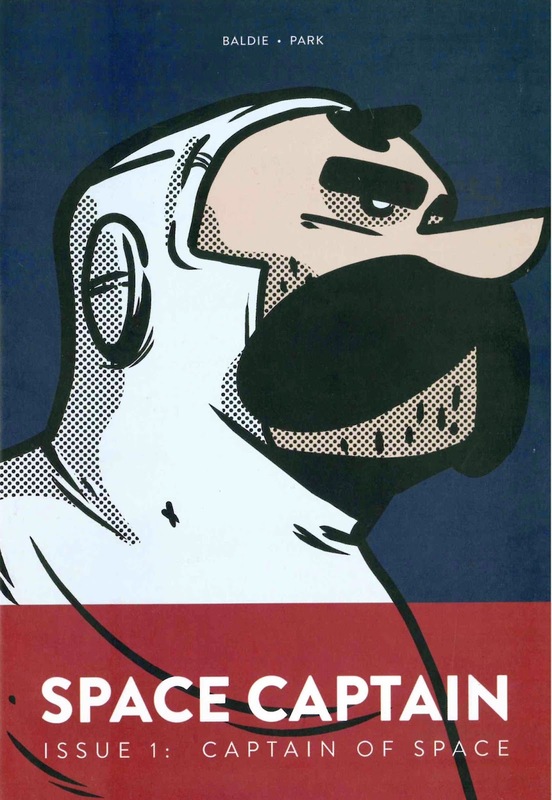 Incidentally I like that cover a lot: there's something Herge-esqe about it- perhaps those stupendous moustaches, and the mixing of that with the iconography of the side profile looking outwards and slightly upwards, ready to take on the world and all comers, the red white and blue connoting western imperialism. Simple and effective. Space Captain opens with a neat little riff on The Thing. A figure walks a snowy landscape with various science-y contraptions to discover something in the ice. Only in the panel before we're shown the amazing discovery, he throws back his hood to reveal he's an alien. And the 'thing' in the ice is a frozen human. We quickly learn, however, that the human is actually more alien that we thought- he's been encased in the ice for decades and the human race is now extinct. Needless to say, there are parties both good and dubious who are very interested in this discovery and want their mitts on that human. On Space Captain's part, he seems to be suffering from memory loss- the last thing he remembers is falling and then: nothing. I appreciated Space Captain's characterisation here: he's vulnerable and cautious, quiet, trying to figure out what's happened, where he's turned up- I liked all these qualities in lieu of the wild panicky, shouty, paranoid, hostile guy so often utilised in similar situations. That smart characterisation extends to others, although perhaps to a lesser degree, but Baldie and Park don't rely on trope and type but use that familiarity to connect readers with the work- I already love Doc. And that ability to make readers care always helps- you find yourself aligning with certain characters and invested in what happens to them- it's a story with heart. The art is very good: backgrounds are kept largely sparse, but the style is appealing and works cleverly as a foil to both the brevity and the humour present. The panel layouts are inventive but sometimes needlessly so- more thought could be given as to why a particular size, number or orientation is being employed and what effect it has- at times this seems to be done haphazardly and the constant change can get annoying. I enjoyed a two panel sequence in which someone is knocking on the door and Doc scoots over on his swivel chair to open it. In the left panel he's at his desk not wearing his glasses and in the second he's pulled himself together and moved to wards the door. The section of room in the background is shown as one, the only thing splitting the two Docs and time is the gutter. Neatly done. There's a great panel in which these two squiggles make up the whole of Doc's hair and hairstyle, and it's brilliant, really quick, loose lines that just work. One of my frustrations with reading part ones and volume ones (and I'm not really talking regular mainstream comics here, but books which have a few months to a year in between installments) that lead directly into another part of the story is that they can too often be poorly executed. Whether it's because the story wasn't really intended to be broken up, and reads like it's abruptly been cut off, or that it's divided into sections that are too slight. Baldie and Park do a fantastic job in achieving a balance that provides setup and hooks interest in a way that feels satisfactory and fulfilling: a few key characters are introduced, the premise is deftly established, the story gets going. At the close of Space Captain, there's a sense of one cycle ending and another beginning- by the end, Space Captain has been anointed, and purpose regarding what to do next set out, so there's some idea of possible trajectory while much is still left to explore and be explained. That it is also funny, warm, and mysterious makes it all the more commendable. Very solid, engaging storytelling. I'm eagerly looking forward to that second issue.